Consensus Sentences (bold) captured by the proposed CIDEr evaluation protocol. 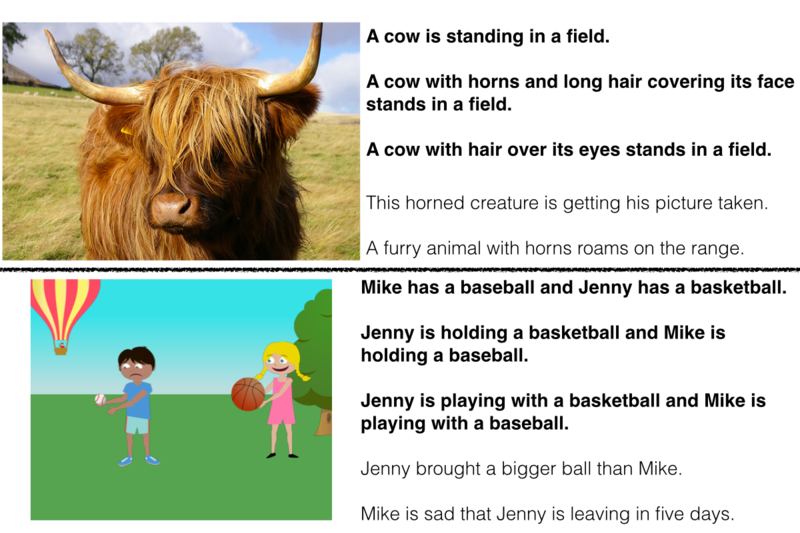 Automatically describing an image with a sentence is a long-standing challenge in computer vision and natural language processing. Due to recent progress in object detection, attribute classification, action recognition, etc., there is renewed interest in this area. However, evaluating the quality of descriptions has proven to be challenging. We propose a novel paradigm for evaluating image descriptions that uses human consensus. This paradigm consists of three main parts: a new triplet-based method of collecting human annotations to measure consensus, a new automated metric (CIDEr) that captures consensus, and two new datasets: PASCAL-50S and ABSTRACT-50S that contain 50 sentences describing each image. Our simple metric captures human judgment of consensus better than existing metrics across sentences generated by various sources. We also evaluate five state-of-the-art image description approaches using this new protocol and provide a benchmark for future comparisons. A version of CIDEr named CIDEr-D is available as a part of MS COCO evaluation server to enable systematic evaluation and benchmarking. CIDEr is maintained by vrama91. This page was generated by GitHub Pages using the Cayman theme by Jason Long.